Well, just in case you read RSS and you missed my tweet ... everything you need to know in github repository. This is an early introduction to a project I have been thinking about for a while. The project is already usable in github but the documentation is lacking all over the place so please be patient and I'll add everything necessary to understand and use yuno. Let's face the reality: today there is still no standard way to include dependencies in a script. If we are using a generic JS loader, the aim is to simply download files and eventually wait for one or more dependency in order to be able to use everything we need. The require logic introduced via node.js does not scale in the browser due synchronous nature of the method itself plus the sandbox not that easy to emulate in a browser environment. The AMD concept is kinda OKish but once we load after dependencies, there is no way to implement a new one within the callback unless we are not exporting. Specially the last point means that AMD does not scale properly with already combined code because AMD relies in the module/folder structure itself ... so, cannot we do anything better than what we have so far? Both plugin and extraStuff needs jQuery to be executed ... will jQuery be loaded twice? Nope, it's simply part of a queue of modules that needs to be resolved. As soon as it's loaded/added once, every module that depends on jQuery will be notified so that if the list of dependencies is fully loaded, the callback passed to and will be executed. Modules are only one part of the proposal since we may define a script where no external dependency is needed. The yuno.add method reflects Object.defineProperty which means for ES5 compatible browsers getters, setters, and values, are all accepted and flagged as not enumerable, not writable, and not configurable by default. Of course we can re-define this behavior but most likely this is what we need/want as default in any case ... isn't it? For those browsers not there yet, the Object.defineProperty method is partially shimmed where __defineGetter/Setter__ or simply the value property will be used instead. Bear in mind this shim may change accordingly with real needs but so far all mobile browsers should work as expected plus all Desktop browsers except IE less than 9 ... not so common targets for modern web sites. Last, but not least, yuno logic does not necessarily need the add call so feel free to simply define your global object or your namespace the way you want. However, as I have said before, the add method is a simple call able to make things more robust, to speedup and ensure notifications, and to use a standard, recognizable pattern, to define our own objects/functions being sure nobody did before thanks to defaults descriptor behavior which is not writable and not configurable indeed. This is just an initial idea of what the yuno object is able to do but few things are in my mind. On top of the list we have the possibility to shortener CDN calls via prefixes such "cdn:jQuery", as example, in order to use most common CDNs to load widely shared libraries. Last, but not least, the reason I am writing this is because I am personally not that happy with any solution we have out there so if you are willing to contribute, please just leave a comment, thanks. since the discussion about a better Function#bind will probably never end, and since a must have dependency would be the ES6 WeakMap which is in any existent shim leak prone due lack of control via ES5+, I have proposed another way to solve the problem. Got it? Events property is simply an object shared through the prototype with properties name that are exactly the equivalent of DOM events name ... easy! The main problem with proposal is adoptions and I would like to know UI Framework users feedbacks. Ideally this way to handle events could become a de facto standard dropping the redundant and massive usage of Function#bind for cases where the focus should be for the instance and not for the callback. There are a couple of things I have never liked that much about Function#bind and this post is about proposing a pattern hopefully better than common one. A common argument about parentheses around inline invoked functions is that developers can easily recognize them. Of course if there is an operator that function will be executed, why on earth anyone would do that otherwise? Anyway, the problem with all of these human friendly syntax pattern recognition strategies, is that the context of the function, or the whole code behavior, could be polluted/changed via bind or call or apply so we need in any case to scroll 'till the end to better understand what is going on inside the function and what is returned, exactly. The summary is that bind, used inline, is more like a yoda condition rather than a developer friendly helper so the first point is that bind, as it is, forces the developer to always check the end of the function to know if this has been executed inline or it has been bound to a different context, as well as yoda conditions forces the developer to read "upside down" a statement. Ok, agreed, a function bigger than 10 lines is not that good and should be split and blah blah blah ... point is that sometimes function have to be big since these provide us a way to create private variables and methods ... ok? Also if that was "the good part", I mean just putting parentheses around, there is some conflict with the fact that functions should not be that long ... I mean, how can we mistake whatever happened in 10 lines? The truly good part could be done by developers, specially those that work in a team. Got it? Nobody would ever complain about these little helps ... isn't it? But since we are all lazy devs, the second helper is function declaration rather than function expression. With a single line to read I believe the problem is solved ... isn't it? Still ways to improve. The second most annoying thing ever, something that leads inevitably to uncomfortable patterns, is the inability to retrieve an already bound function through the same object. In my humble opinion, was a freaking design mistake indeed to create a new bound object per each bind call since I believe nobody in this world ever used this "feature". 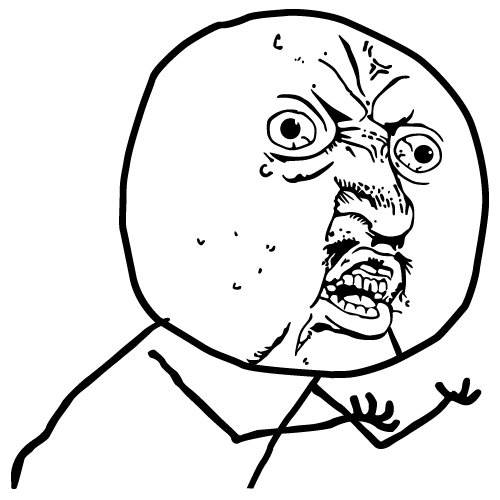 // Y U NO THE SAME !!! If the function is the same it means it has same context, inner and outer scope of the other function bound to the same object. If we bind twice the same object we are doing it wrong 'cause most likely we never meant/need two different bound callbacks/objects for that task ... isn't it? // how many times have you seen this later on? Above example won't work as expected ... of course it won't work as expected ... developers expect the same function/object, instead they have a new one. This approach forces developers to store temporarily the bloody bound function to some private, global, variable or property. With ES5 we are so lucky to be able to pollute global constructors without influencing for/in and as long as our implementation is not obtrusive and, most important, makes sense. BOUND_TO = "boundTo", // or maybe "asContextOf" ? callback = i < 0 ? No need to check, no need to store the bound version, memory leaks safe, no need to do anything extra except calling the method through, and this is needed, the same function. The semantic is straight forward and rather than a yoda condition we have a clear operation that means: return the function created to bind this object as context. Memory speaking, the very first time we use this strategy we create two extra arrays able to speed up operations through indexed function and and bound version per each object. This is inevitable in any case and it's almost exactly the same we do when we address once the bound function. Once the object has been Garbage Collected, related private arrays will have a reference count equal to zero so the memory should clean up automatically without problems and including all functions bound to that object. As explained in the example, it is possible in any case to release explicitly bound functions so we can feel like the memory usage is under control. The combination of arguments could be such big number that this technique won't be interesting anymore, specially regarding performances. It does not really make sense to over complicate such basic, most needed, scenario but if you think this is the biggest impediment, then the name should simply be asContextOf so that no ambiguity would be shared with bind native signature. I am pretty sure this simple lazy created proposal would be ideal for many frameworks and projects but if I am missing something or if you have any improvement to suggest, I will be more than happy to listen to you. Enjoy simplicity over semantic, this is yet another KISS and YAGNI proposal from this blog.